Taxi safety is pretty simple and foreign taxis are generally perfectly safe, but bad things can happen -- in April 2006, for instance, the bodies of two Austrian backpackers, victims of a lethal taxi scam, were found in Bolivia, and women have reported being kidnapped in foreign taxis. Get the top foreign taxi safety tips and you'll know how to stay safe in a foreign taxi -- and won't need to worry whatsoever. You can usually find a taxi stand on the street in any country -- even if you can't read the words, you'll notice taxis congregating near the sign. Generally, only cabs authorized to carry passengers are allowed to stop at these cab stands, meaning the taxi is as safe as that country mandates, and the cab driver licensed. Look for these cab stands at foreign airports, too: finally, don't let aggressive drivers or their "helpers" steer you into a cab without sussing out the sign scene first. When you see taxis at a taxi stand, note the types, colors, or logos even if you don't need a cab now -- you can avoid a "gypsy" or fake taxi later if you have an idea what the city's legit taxi companies' cars look like. Fake taxis can be being used by criminals to part you from your money in many ways -- or worse. A taxi that doesn't look like the others probably isn't like the others. Conversely, if all taxis look the same, like VW bugs in Mexico, they're probably safe. Every taxi company everywhere wants to advertise. Legitimate taxis usually have the taxi company's phone number plastered on the roof, doors, and trunk. A taxi without a phone number doesn't want to advertise -- why would that be? Don't get into a taxi without a company phone number advertised plainly somewhere on the cab's exterior unless all the taxis are clearly the same. A legitimate taxi will probably have a meter and two-way radio inside; look for either before you get in and feel free to wave the cab by if you don't see them. A taxi may not use a meter and still be safe, but a taxi without a radio -- fuhgeddaboudit. Every taxi needs to communicate with a base -- without a real one, it may not be a real taxi. 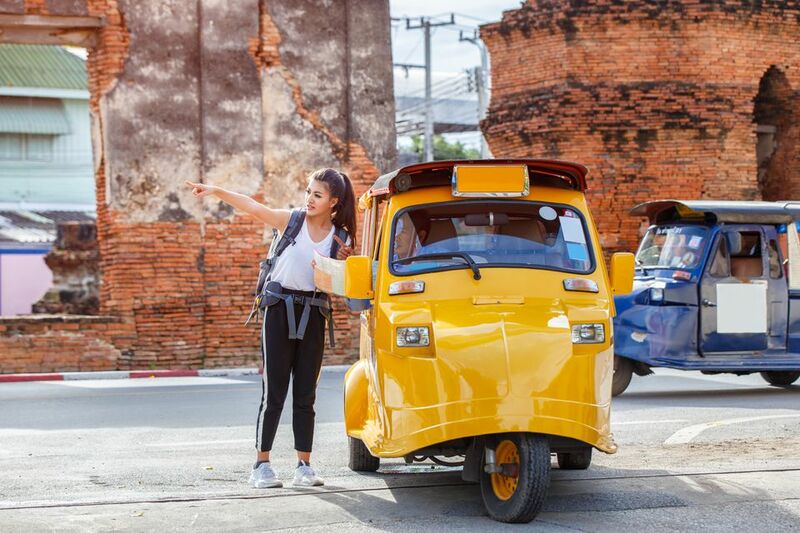 Having a general idea where you're headed will help keep you out of trouble in a taxi -- even if a neighborhood looks unsafe, it may be a shortcut, though; or the neighborhood to which you're headed may actually be unsafe if you're an adventurer. However, if you know you should be going north to the city center and you're headed south in a slum, feel free to get out at the earliest opportunity. Toss money over the seat in case you're mistaken and all's well, and you won't be chased. Always keep your bags right beside you or at your feet in a taxi. If you must jump out fast, you'll have to leave your bag if it's in the trunk (and the driver can leave with your bag if you get out before he does). If you're in an emergency situation, leave the bag, no matter what -- you can run faster without it, anyway. Don't get into a taxi without checking to be sure that there are door handles inside the passenger compartment. It goes without saying that you can't get out in a hurry if you can't get out at all. It's okay to ask to see a policeman's badge if your taxi is pulled over. A real cop probably won't mind a polite request if it becomes clear that he wants you to get out or to follow him. Don't leave a busy street until you know you're following a real cop. Bear in mind that in some places, like Bolivia, fake police uniforms and badges are common -- don't get in a cab with anyone dressed in a cop uniform or showing , , period. Say you'll meet at the police station instead. Sharing a cab with strangers can help you stay safe and save bucks -- but it's a scam in some places: your taxi stops for an accomplice posing as a tourist who is carrying contraband of some kind. When a fake cop subsequently stops your cab and the stuff is "found," you may be about to be searched and robbed, or possibly taken to a fake police station while your credit cards get used. Seriously. If you're okay with taking a non-licensed taxi and taking your chances, you may save some cents on a cheap cab ride. Be prepared, though -- this is the time to carry a phone. Know the local emergency number (foreign equivalents of 911). Watch for street signs so you know where you are. And always, always be ready to jump out and run like the wind.